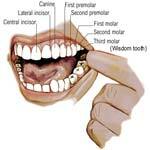 Tooth Decay Symptoms - What Is Causing You Trouble? While tooth decay symptoms include pain from the infected tooth, one may also have a sour taste in the mouth as well as bad breath. Since bad breath is an indicator of bacteria in the mouth, bad breath remedies are suggested so that further tooth decay or gum problems do not arise. Loose fillings can be another tooth decay symptom. Over time, fillings may dislodge, leaving susceptibility for re-occurrence of further decay. A broken tooth can also cause much discomfort, especially when applying pressure from eating or brushing. Children as young as 18 months old can suffer from tooth decay symptoms caused by baby bottle tooth decay, a condition from giving a baby a bottle at bedtime. The milk or juice will linger in a baby’s mouth and turn into an acidic tooth decaying fluid which may cause tooth discoloration and decay. More severe tooth decay symptoms may be caused from a tooth abscess, or a pus filled sac which settles in the bone at the very bottom of the tooth resulting in intractable pain. Fever may also be present as well as a tender and swollen jaw. Glands may also be swollen when a tooth abscess is formed. Preventative care is the best way to prevent tooth decay symptoms of any level to arise. Keeping the mouth free of bacteria by regular hygiene and visits to the dentist will prevent tooth decay issues before they begin.